A really interesting game that someone mentioned to me was Sentinels of the Multiverse. In Sentinels of the Multiverse, each player takes on the role of a hero (or two heroes in two-player) attempting to defeat the evil <insert villain name here> and thwart his dastardly plans! The game turns play out pretty simply. First, the villain takes his turn by performing his "start of turn" effects, drawing a new card, then doing "end of turn" effects. Next, each of the heroes in succession get to take their turns by playing a card, using a power, and then drawing a card. Finally, the environment takes a turn (after all, these epic encounters have to take place somewhere, right?) by following the same three steps as in the villain's turn. If you are able to knock the villain unconscious (or kill him, depending on whether you read PG or R rated comics), then you are successful, and order has been restored to the Multiverse! The first significant pro for Sentinels of the Multiverse is the replayability. The game comes with 10 different heroes (each with his own completely unique deck), 4 villains (with their own decks), and 4 environment cards (again with the unique deck thing). Each game is played with 3-5 heroes depending on the number of players, 1 villain, and 1 environment. This leaves you with over a hundred unique scenarios to play. 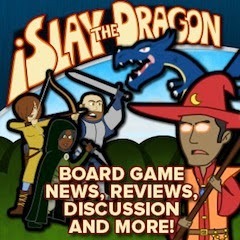 The next pro for Sentinels of the Multiverse is that it is very easy to teach. 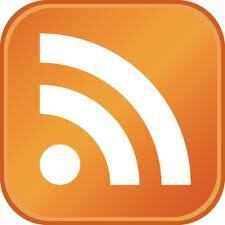 Did you read the summary? Then you know most of how to play the game. If there are conflicting things occurring at the same time, then whichever card came out first happens first. Now, there are still some sticky situations that you get into (such as when a single card has an effect that causes it to flip, and then has a new effect that was supposed to occur at the same time), and so you'll occasionally have to use your best judgement, but really, the game itself allows anybody to easily pick it up and start playing. Do I like games in which I'm allowed to build the deck instead of it being pre-constructed? Sure, but that doesn't mean that there's not a place for both. The third pro, which is really unique to Sentinels, is that the villain and hero cards are two sided. First the villain cards - the two sides represent two different states of the villain. The starting side is normally when they are working on their evil schemes, and the second side is when either something has foiled their plans, or when they have succeeded and become much more powerful (depending on the villain). This is a unique mechanic in the game that really works very well, and forces the players to be aware of how their actions can affect the villain and his strength. Next for the heroes - the back side of the card represents what happens if the hero is knocked out of the fight. Whereas most games handle player elimination by allowing that player the opportunity to go get a snack and wait for the next game to start, in Sentinels the heroes are still trying to will their comrades onto victory. I must say that I like this more than how the elimination mechanic works in most other games (here's looking at you, Lord Of The Rings LCG and Bang!). Unfortunately, with all that Sentinels of the Multiverse did right, there are several things that they did that most definitely go under the "con" category. First and foremost, there are situations that can arise in the game, completely outside of the control of the players, that can for all intents and purposes cause the players' turns to be non-existant. In one of the games we played (with Citizen Dawn as the villain, and the Megalopolis as the environment), we were in a situation in which we weren't allowed to draw cards, weren't allowed to play cards, and had to discard two cards each turn. In order to get rid of one of these effects, we all had to discard a card during the environment phase - of course we didn't have any, because we couldn't draw any and had to discard two per turn. After looking further through the environment deck, we realized there was also a card that prevented heroes from playing a power (the one thing that we were still allowed to do - though with minimal effect as all the damage we dealt was immediately reduced by one of the villain cards and healed by another). So, if there is a potential situation that could arise where you can't draw cards, play cards, or use a power, this seems like a major con to me. I do not think that this situation will arise in every game, nor even in most games, but when it did arise it was so incredibly frustrating that I don't think I'll ever be able to convince the people I was playing with to try the game again. I expect cooperative games to be challenging, but I expect them to be won or lost significantly based on the decisions that were made - there was nothing we could have done to prevent the order that these cards were drawn, which set up that scenario. This was basically like an issue of a comic in which the hero wakes up and gets food poisoning from undercooked chicken and dies. Who would read that? The next con to the game is that there is a lot that you must keep track of. For example, we had situations in which the environment card gave all damage a +1 bonus, a hero gave all other heroes a +1 bonus, and one of the villain cards reduced damage to all villains by 1. So, you had to remember that each attack from a hero against a villain card has a net of a +1 bonus. We constantly found ourselves in the "oh yeah, we forgot..." situation and had to re-adjust how much damage was dealt on any given attack. Thirdly, the format of play 1, power 1, draw 1 has a very limited feel to it. Whereas you're actually doing more than in many other cooperative games (such as Pandemic where you often spend your entire turn moving), the options that are available to you feel much more constrained. Part of this might be because several of the cards in your hand are awesome in certain situations and worthless in others (such as dealing one damage to all the villain cards when there is a villain card that reduces damage by one). I think the main thing is that the strategy is much more limited - each turn it is simply asking yourself, "ok, what do I have that deals the most damage?" Whereas the game is very simple to learn and teach, this is the downside of that simplicity. The final con that I must mention is the packaging. The box is very, very pretty. Unfortunately, it is beyond useless when it comes to functionality. I desperately hope that they fix this in future printings. The box, which is meant to hold several large piles full of cards that need to be kept separated, is a short flat box in which the cards must be set into 6 piles that are next to each other (I took a picture so you could see what I mean). Long story short, the cards are going to get intermixed every time that you move the game anywhere and you'll have to go through all of them to make sure that you have all of the cards for the decks that you need each time you play. Again, I really hope that they look at how other games like Thunderstone: Wrath Of The Elements have done their packaging with making a card box with dividers and fix this problem in the next edition. Overall, I give Sentinels of the Multiverse a 7.0/10. The first con that I mentioned was bad enough that I really debated a 6 or lower for a little bit, but after I stepped away from the game, cooler heads prevailed. There really are a lot of great aspects of Sentinels, but I think that I'm going to avoid playing another scenario with the Megalopolis environment - assuming I can convince people to play with me again. Want some more opinions? You can read this Sentinels of the Multiverse review at Play Board Games, or for yet another opinion, check out this Sentinels of the Multiverse review from Games With Two . Or, if you're looking for other games you might enjoy, check out Glory to Rome, Flash Point: Fire Rescue, and Summoner Wars. I would like to thank Greater Than Games, LLC for providing me with a review copy of Sentinels of the Multiverse to play. Another game that I've looked forward to playing for quite a while is Alien Frontiers . In Alien Frontiers, each player takes on a fleet of ships (dice) trying to successfully colonize a distant planet. 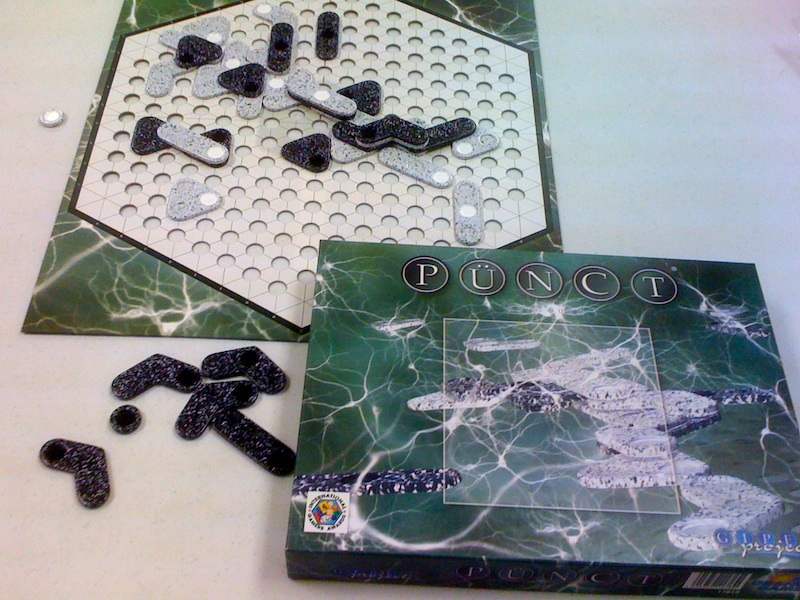 On each turn, the player rolls the dice representing ships and, depending on what he rolls, can perform different actions. Some actions reward you for having numbers that match, some reward sequential numbers, some are useful when rolling high, others low, and some don't care at all. What affects this even more is that what you can do is dependent on what your opponents have done before you - if the spots on the board are already occupied, then you cannot place your ships there (unless you shoot them off with a Plasma Cannon). Anyway, each turn, after rolling, you decide where each of your dice are placed; but with the ultimate goal of placing colonies on the planet (there are three actions that directly help you with that goal). The game continues like this until one player has successfully placed all of their colonies - at which point the player with the most points (from colonies and Alien Technologies) is the winner. The next thing that I like about Alien Frontiers is the bonuses - both from having Alien Technologies and from controlling certain areas on the planet. These bonuses are valuable enough in the game that they are worth pursuing; and yet, they are not so powerful that the person with the most will win (with Alien Techs at least - you do win by having tons of colony bonuses because that means you've placed tons of colonies). Because of this, each player must decide carefully between how many Techs he needs and how often you should use your dice to pursue other interests - such as getting a colony closer to launch. The final pro that I will note about Alien Frontiers is how player interaction works. Granted, I (to this point) have been too nice during the game and have not attempted to destroy my enemies' fleets yet, but I like the different ways that players have of interacting. You can never affect another player when it is not your turn, but you can really wreak some havoc when it is. Specifically, one of the locations allows you to rob other players of resources and/or Alien Tech cards (if you roll three sequential numbers). This can be quite useful. Another way that you can affect other players is with Alien Tech cards. However, to keep this in check, you normally have to lose your Alien Tech to drastically impact another player - and this is a very steep price! Therefore, the game is setup so that you can definitely interact with ("attack") each other (and get rewarded for doing so), but has also implemented measures to keep the game from becoming an all-out war game, which I appreciate (after all, I play stuff like Risk 2210 A.D. when I want to do that). The only real con that I have for Alien Frontiers is that the last few turns can really turn into quite a bit of "Analysis Paralysis". After the first game or two, turns will really go fairly quickly since players will know where their dice can be placed and have a general strategy... until the end. The last couple rounds of the game can lead to significant over-analyzing from normally quick players. This is really a situation that occurs in a ton of very good games (Power Grid comes to mind), but is still fairly annoying when it happens. 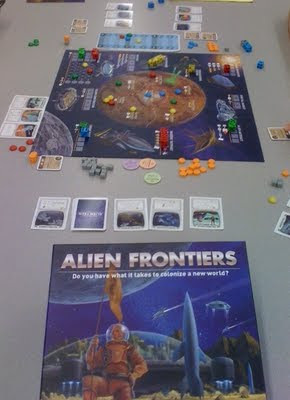 Overall, I give Alien Frontiers a 9.0/10. I really enjoyed my time with this game, and, as hard as it is to live up to several months' worth of hype, Alien Frontiers did not disappoint my expectations. I can see myself continuing to play this dozens more times! Value diversity of opinion? You can also see an Alien Frontiers Review from the Board Game Family, or another review of Alien Frontiers by Games with Two. But you might also want to check out Steam: Rails to Riches, Stone Age, and Bootleggers. I would like to thank Clever Mojo Games. Whereas this is where I normally tell you that a game company has sent me a demo copy to review, that is not true of this title (though I have been promised a copy from the third printing to replace my copy that got damaged in a tornado). I actually pre-ordered a copy of the second printing of Alien Frontiers and wrote this review based off of that. However, after the tornado, I received immense amounts of support from the fine men that run Clever Mojo Games. David MacKenzie sent me three boxes full of games from his personal collection to help restore my collection and to donate to the people of Joplin - and many of these were very good, sometimes rare titles, many of which were still in the packaging! Not only did David send me games, but Fred MacKenzie followed suit by sending me several more games. 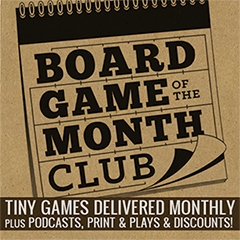 This company is truly run by very giving individuals who love the hobby of gaming, and I cannot encourage you enough to go support them by purchasing Alien Frontiers and any other games that they come out with. Did you know that there was a Stargate SG-1 Board Game ? If not, I'm sorry that I brought it up - I may have given you false hope that there was a Stargate SG-1 board game that was worth playing... which, in my opinion, is yet to be discovered. In Stargate SG-1, which feels very similar to Risk (but not as good), players take turns collecting armies and ships and then moving around attempting to take opposing Stargates. When they encounter enemy units, they roll a die per number of ships or combat units involved (only once though, and there can only be one ship per space, so the "exciting" die rolls will be fights with 2 on 2 combat unit rolls). The object of the game is to control a certain number of "sectors" (ie, space continents), and once one person has a certain number of them and keeps them for a full round, they are the winner. The first (only) pro for Stargate SG-1 the board game is that the pieces look cool. I would say that the production quality is high, but that's not true. In fact, to go along with the 840 cool plastic playing pieces, you also get a "Phenomenial board of the universe." That's right - phenomenial. This not only made it into production, but it is on the back of the box where they are trying to advertise how good their game is! So, yes, the pro is that the plastic pieces look cool. In Stargate SG-1 (this was in a 2-player game) most of the game was spent sprawling armies across the galaxy. You're not really trying to defeat your opponent (after all, if you have a bad roll when attacking 1 of his ships with 3 of yours, you wasted 3 ships for the turn and lost a ship by doing so) - instead you simply try to take up more space than he does. And, whoever goes first seemed to have a major advantage because they were able to sprawl out and gain a handful of Stargate cards that can be used to blast their opponents (everyone gains these, but the first player gets to use his to nuke his enemies before they get extra reinforcements). We realized who was going to win the game before the first turn was over! I really hope that we missed something here and that we were supposed to place neutral units on every sector to start the game. Aside from these problems, even if you could get past the sprawling and the seemingly unbalanced nature of turn position (that is incredibly apparent in two-player), the game itself doesn't really seem very fun. Since you cannot have more than one ship on a single space at a time, and you can't continue the attack if you lose on your first roll (in a three-on-one scenario), I found the fighting aspect of the game to really be pretty boring. It seems wasteful to spend an entire turn preparing for a few fights and then rolling poorly and losing ships - and then not being able to press the fact that you still have a numbers advantage. I don't really know how to express this. The game really feels like Risk (and I don't really like the original Risk in the first place), but I didn't even like it as much as Risk! I can continue trying to say more things I disliked about the game - like the fact that the pieces barely seem to fit in the territories, even with the only one ship per space limitation, but why continue ranting about a game that you hopefully have already been able to form an opinion of. Overall, I give Stargate SG-1 a 2.5/10. I really desperately hope that we missed something that was absolutely crucial to the game (every time we read the rules, both now and when we first got the game several years ago). It makes me sad that games like this are made specifically to get people to buy them based on theme - it causes people to be more hesitant when good games like Battlestar Galactica come out. Instead of playing Stargate SG-1, you might consider trying Star Trek: The Next Generation Deck Building Game, Lord of the Rings: The Card Game, Sentinels of the Multiverse, or just about anything else. A new spatial reasoning game that I stumbled upon at my FLGS (Friendly Local Game Store) was Abalone . Abalone is played on a hexagonal board in which the players each control one color group of marbles (black or white). When moving marbles, the following are all legal: moving 1-3 marbles laterally, or using 1-3 of your marbles to "push" your opponent's marbles. If you push marbles, you must have more marbles in your line than your opponent, and you can only push up to two of your opponent's marbles (in a single move). Players take turns making their moves and attempting to push their opponent's marbles off the board until one player has knocked 6 of his opponents marbles off. Now for the pros and cons section. (Good luck, I always have to make this up on spatial reasoning. I try to get more and more creative so they don't all sound the same. Otherwise, you would constantly be reading "I have no idea what I'm doing in spatial reasoning games." Of course, I think that that is why I like them. Anyway...) The strategy in Abalone seems fairly deep. There are enough marbles and enough empty spaces that there are many moves and counter moves. Just when you think that you have one of your opponent's marbles pinned down, he will make a lateral move that will cause you to be horribly out of position. You must also occasionally balance whether it is more important to play offense or defense; I often encountered situations in which I could knock off one of my opponent's marbles, but at the cost of one (or more) of my own. The combination of pushing and lateral movements works very well in this game, and a large reason for this is that it is built on a hex map. If the game were built on a square, I do not believe this would work at all. One of the best strategies that I have found so far is to cut off my opponent right after he has pushed my marbles. For example, if he has used 3 marbles to push 2 of mine, I find it advantageous to be able to then push one of his 3 marbles from a different angle so that he no longer has the power to push my marbles. Another strategy that I have found in the game is to get my marbles intermixed in a large group belonging to my opponent (or "arch-nemesis" if you prefer). If one of my marbles is in the midst of his, it can often cause him to be unable to get 3 marbles in a row, as he is not allowed to push my marble into one of his own marbles. This can cause my rival to get out of position while I try to counter him from a different angle. Now for the obligatory spatial reasoning paragraph. I really like spatial reasoning games (that I consider "good" spatial reasoning games), because I never feel like I'm good at them. They seem to challenge my mind in an entirely new way than any other game that I have played. I realize that these games aren't for everybody, and that's ok. In fact, I was not really a fan of the genre until the last few months, and since then I have been trying as many of them as I can. In trying all of these, I find some occasionally that jump out to me as favorites almost immediately. Abalone is one of those new favorites. Now for the cons. First, I haven't really decided if I think that people will get together specifically to play Abalone. With that said, I am sure that people who truly enjoy spatial reasoning games do get together to play them, but I suppose that I should say I cannot see myself meeting with someone for the sole reason of playing Abalone. However, I do think that I would get together with someone to play a handful of games, one of which would be Abalone. The next con that my wife pointed out while we were playing is that it can be potentially difficult to visualize the game. 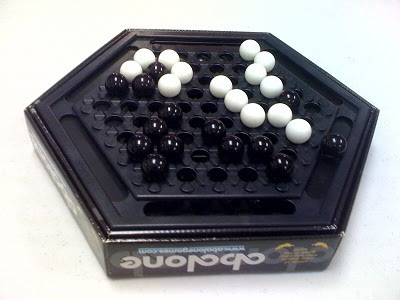 Since the game is played with black and white marbles on a black background, it can be difficult because of the lack of contrast between the black marbles and the black playing area. This was not something that I had trouble with, but it is something that she pointed out as a problem for her. Overall, I give Abalone an 8.5/10. It has jumped to the top of my spatial reasoning list right alongside of Gipf, Yinsh and Dvonn, and I look forward to continuing to play this game. Now for a quick card game review for a quick card game: Aquarius . In Aquarius, each player gets a goal of which of the five elements they represent. From here, the objective is to connect 7 cards together, each of which represent your specific element. The different cards that can be played may only represent one element, may be split in the middle and represent two elements, or may be quartered and thus represent four elements. In order to play any of these cards, you must place the new card so that it faces the same direction as the previous card (no perpendicular placement) and so that two elements match. However, they do not need to be your elements - if you are playing as the earth, it may be in your best interest to connect two stars on cards that both have the earth on them. This would still count as your elements being connected, since they are on both cards. But, beware! There are action cards in the game that allow you to "zap" cards (take them into your hand), move cards, and even change goals. The thing that I liked about Aquarius was that it was a simple game that could easily be played with just about anybody. The game I believe claims that it is for 8+, but it could probably just as easily be taught to a 6 year old. I'm not even sure that you would need to be able to read to play the game as everything is picture based - if you could teach your kid what the pictures on the 4 action cards meant, then they would be able to play. I think it's even short enough that it might fit into their attention span, and it is small enough to be taken with you and brought out whenever you needed to entertain them. Unfortunately, that was really about all that I liked about the game. This is a Looney Labs game (the people that brought you Fluxx, which is a really awesome game), but I think they missed the mark on this one. This game just seemed pretty boring to me. Yes, I could play it more, but the ultimate question is, why? There's not really all that much strategy to the game, but there's also not really an element of exciting randomness (the closest there is occurs when someone messes with the goals, but that is more annoying than random). I don't really know how to explain to, but on these silly little card games, some are hits and some are misses. 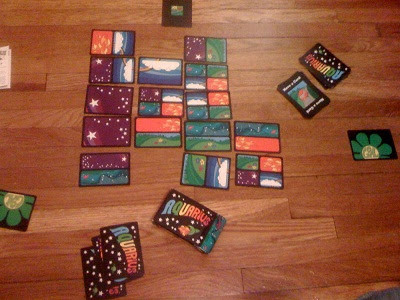 Whereas Fluxx I considered to be a great hit (I should write a review about it...), Aquarius is a miss. I think part of it is that there is so little that you can do each turn. It keeps with the standard "draw one card, play one card" game flow of the rest of the games by Looney Labs, but the other ones all allow you to break out of the mold in some way. In this one, you are simply drawing and playing a card each time. Overall, I give Aquarius a 6.0/10. Whereas I didn't think the game was especially fun, I also didn't feel like it was a chore to play it (which is more of the 5 and below range). I could play it again if someone else brought it and I was trying to kill time, but they will need to bring their copy, because I intend to get rid of mine. If you like light games, you might also check out Gloom, For Sale, and Hey, That's My Fish! A game that my friends brought with them and taught to me was Chaos in the Old World . In Chaos in the Old World, each player takes on the role of a demon that is attempting to corrupt the world "correctly" (using his version of corruption, not the other demons' corruption) in order to defeat the other demons. To do this, each player takes turns summoning his different units onto the board (each demon has 3 different types of units), and players can also use their summoning points to play chaos cards. After the summoning is complete, the players battle each other (assuming that there are units in the same space that can fight). Finally, the "cultists" that have been played by each demon play "corruption" markers on their spaces (if they are still alive). After this, all that remains are end of turn cleanup activities. This goes on until one of the players has achieved one of the victory conditions in the game or until the end of the 7th turn (in which all of the demons lose for not getting around to corrupting the world fast enough). The first thing that I liked (no, loved) about Chaos in the Old World was that each playable character was completely different. One of the demons was "Khorne" (which I probably misspelled) - he was the demon of war. His goal in the game was to kill opposing figures in as many different territories as possible each turn. Not only do the different demons have different goals, they also all have different chaos cards, upgrades, units, mixes of units, etc. Basically, playing a different demon requires an entirely new strategy and outlook on the game. This adds amazing amounts of replayability to the game, and is just downright amazing. I have played very few (if any) other games that really brought a completely different element to each playable character in a game like Chaos in the Old World, and yet felt balanced enough that any of the characters had a fair chance at winning the game. 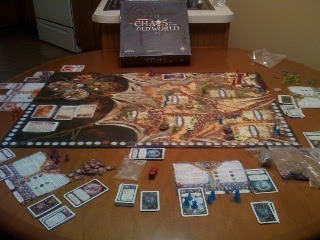 The next thing that I liked about Chaos in the Old World was the replayability of the game. This is because of the difference in the demons. I know I said it in the paragraph before, but I really, really liked it, so I wanted a second paragraph for it. The "third" thing that I liked about Chaos was the fact that there were different paths to victory. Yes, each demon had a different path he could take, but aside from that, there were actual different ways that each demon could achieve victory. You could win by "spinning the dial" to victory (this happens if you upgrade a certain number of times, which happens if you achieve your demon's goals - such as killing opponents in different spaces like I mentioned before). Another way to win is by getting over 50 victory points. Finally, you can win by having the most victory points when the world is "ruined" by placing too many corruption tokens in it. These different paths really allow the players to try different strategies to see which ones may or may not work well for each demon; they also force players to be aware of the other players attempting to achieve victory while they are not paying attention. Probably the biggest con to the game is the difficulty of playing the different demons. As I start this paragraph, I think I've already changed my mind. This is not a con, this is a neutral point that is worth noting. In the game, some of the demons are much easier to play than others. For example, the war demon is incredibly straightforward whereas some of the other demons have very subtle abilities that can easily be overlooked. Some players will love this, because they can dive into the different playable characters. 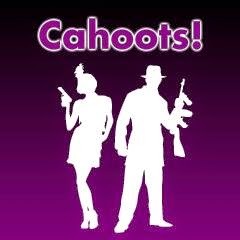 Other players will find it difficult to find people to play the game with as it may be hard to play a balanced game if some players have played more than others - specifically, this may be a barrier to bringing new players into the game. With that said, it is not a great barrier, as the games I have played have all been very close. With the last paragraph turning into a neutral, the only real con I have to the game is that it is hard to see what is going on. The board, whereas it is beautiful artistically, makes it difficult to see where the territories start and end. Also, with the "dial" aspect of the game, it is hard to see what your bonuses are going to be when deciding whether you should go after bonuses or points - and it is also hard to tell how close your opponents are to victory on the dial. Overall, I give Chaos in the Old World a 9.0/10. It was a great game, and I can envision myself playing to repeatedly. Like Fantasy Flight Games? You may also want to try Blood Bowl: Team Manager, Lord of the Rings: The Card Game, and Battlelore (which was formerly Days of Wonder, but is now a Fantasy Flight game). For those of you that have followed my blog for a while, you may remember that I left off my Nightfall review eager for expansions. (And if you haven't read that review, you should check it out here as I'm going to assume that you're familiar with the base game throughout this review and focus on the differences introduced in Martial Law, even though Martial Law is actually a fully playable game without the base set.) 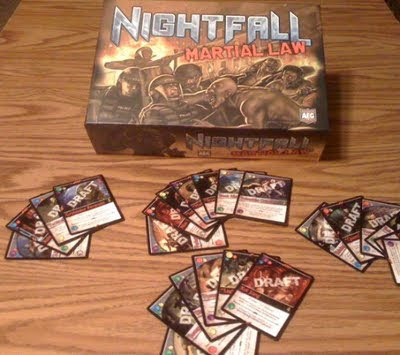 Well, AEG has finally created the first expansion: Nightfall Martial Law ! There isn't really much that Martial Law introduces that is <i>completely</i> new to the Nightfall franchise. The one thing that is introduced is "Feed." Feed allows a player to have an effect continue occurring as long as they can pay the penalty (such as discarding two cards). Aside from this, Martial Law adds depth to a few ideas that were introduced in Nightfall but not all very fleshed out in the base game. For example, in Martial Law there are more minions that are not discarded every combat phase (like what "Bad Smoke" from the base game) , there are new color chains, and there is a new wound effect (in Nightfall, there was only the single wound effect). Now that I've told you the gist of what makes Martial Law unique, lets get to the pros and cons. The first pro that I have for Martial Law is that some of the minions have effects that occur when they attack. For example, "Lone Hound" causes you to exile a card from your hand whenever he attacks. Another one, "Mad Jake" allows you to inflict a wound directly on another player whenever he attacks. I think that these extra things that occur while attacking add some strategy to the game. For example, with "Lone Hound", he can be incredibly helpful by allowing you to exile wounds from your hand late in the game, but early in the game, he might actually harm you by forcing you to exile useful cards (after all, you have to attack each turn). With "Mad Jake," you have the ability to attack two different players at the same time, since he can attack one player and cause the direct damage to go to someone else. However, though there are some neat new elements to Martial Law, I felt like there were a few areas that could have been better. First off, the starting cards are the exact same as those from the base set. Whereas this isn't "bad", it is an area that I thought could have been better. There could have been at a minimum new art on the cards (like they did with Thunderstone: Dragonspire ), or, better yet, they could have come out with new starting decks that players could have used to mix up the game. Then, players would have had the option of playing with the old starting decks, the new starting decks, or a combination deck made of one of each card from the old and new. This could have helped with my biggest con from the base game, which is that the first several turns are all the same - everybody waits until his turn and plays Yuri to gain influence. The next con that I had with the game was that a lot of the cards seemed somewhat bland to me. One example is a card that allows the player to draw one card (with a kicker that each player must destroy a minion). This card really seems to be a filler card that you would only use to continue a chain. Other cards seemed to have very specialized situations in which they are helpful, but for the bulk of the game they would be fairly useless. For example, "Target player discards down to 5 cards and receives 1 wound per card discarded." When is this card useful? When someone has a ton of cards in their hand. When does that normally happen? When they've discarded a ton of wound cards to draw new cards. Which means - this card is really good at picking on the guy that already has a ton of wounds! Several others seem to target vampires or lyncanthropes. Whereas, I knew this would probably occur at some point (why else put the race on the cards in the first place), overall these cards don't seem to be nearly as good as cards that target minions, because they have very similar effects, but are much harder to use (and, to be fair, their effects normally are much greater if they are able to be pulled off). Overall, I give Nightfall: Martial Law an 8.0/10. I was honestly a bit disappointed with the set. That's not to say that it is bad - it is just that the base set is phenomenal, and this set is "only" good. I would recommend picking up the base set first, and once you've played it enough that you need to mix it up a bit, pick this one up and mix them together. I would like to thank AEG for providing a copy of Nightfall: Martial Law for me to review. 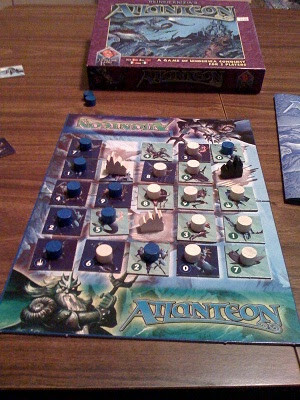 One of the most surprising board games that I've ever played was Atlanteon . In Atlanteon, each of the players takes turns playing a single piece onto the grid-shaped board. They each have pieces numbering from 0-9 as well as a king piece (and there are 3 towers that are placed on the board to start the game). Whenever a piece becomes completely surrounded, then it is scored; to do this, each player adds up the total number of points they have adjacent to the piece (and the piece itself), and whoever has the higher total scores that piece (except with one of the towers that scores by the lowest total). This continues until one of the three victory conditions is met: 1) a player's king is captured (this rarely happens), 2) a player has scored 11 pieces and has his king on the board (the most common scenario), or 3) one player has captured all three towers (this also rarely happens). The first pro of this game is the ease of teaching new players, and yet the depth of gameplay. Like Othello claims to be (but Pentago actually is), I consider Atlanteon to be easy to learn but difficult to master. Within a couple minutes, you can teach a new player how to play the game. Mastering the game will take much longer (in fact, I've played it quite a few times and I'm still lousy at it). More than any other game that I've encountered recently (except for maybe Yinsh), I think that Atlanteon balances these two characteristics spectacularly. The next pro is that I like the different victory conditions. I'll be honest - two of the victory conditions have never happened in a single game that I've played. I've never seen someone's king get captured, and I've never seen someone capture all three towers. However, just the fact that these things can happen is enough. If the only way to win were to capture 11 pieces, then the game would be much easier to master. Having to ensure that you don't let the other player take your king or the towers forces you to play in certain ways that may prevent you from being able to capture as many pieces long-term (because you have to prevent yourself from instantly losing). Overall, I give Atlanteon an 8.5/10. I really like this game. However, since my personal rule on rating (until I change my mind in a few days) is that I won't give a game a 9 or higher unless I can see myself getting together specifically to play the game, I can't rate it any higher. Either way, anybody that likes games like Chess or Hive should definitely try this game. If Atlanteon sounds interesting, you might also check out Architekton, Gipf, the Innovation card game.